I just love bacon!! Well, who doesn’t love thick, crisp bacon no matter what it’s served with. I am always looking for new breakfast recipes to serve to our guest, and I came across this fun blog that has some great recipes and food photos. Little Rusted Ladle has some really great recipes for all types of meals and celebrations. I came across her Bacon Stud Muffins, so of course I had to try them out. Bacon blended into a great batter made from King Arthur Flours and cooked to perfection is just… well…. just awesome. 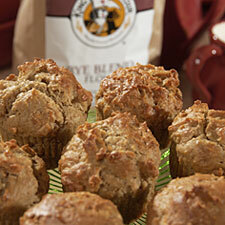 If you love trying out new muffins and really enjoy bacon, then I recommend that you try these out. Let me know what you think and send them a message also on their great recipes. I will be posting more from them, as I love so many of the recipes they are showing on their blog and also from King Arthur Flour with so many great recipes. Until next time… happy happy bacon…. This entry was posted in From the kitchen, Recipes and tagged bacon, king arthur flours, muffins by admin. Bookmark the permalink.